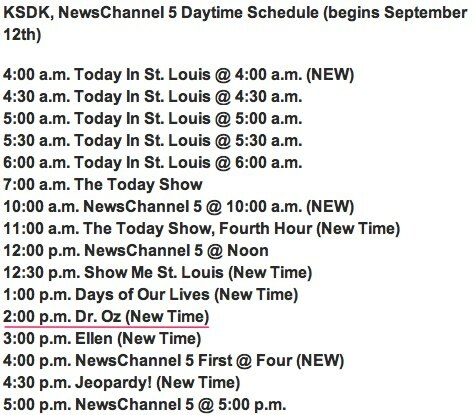 Though calling this a “Hot Topic” seems a little strong, local NBC affiliate KSDK has announced their move to kill all the fun of day-time reruns and instead bring us nearly a full day of news and “news-like” programming for a city that pretty much only has the Cardinals, the Rams, murders, and tornados to cover. It seems pretty clear that the sheer amount of murders to cover in a given day necessitated the new-centric schedule, but we’ll let them tell you about all the great people they have. Our new fall lineup reaffirms this commitment that local news in St. Louis is our first priority. We’re very lucky here at NewsChannel 5 to have a wealth of veteran, on-air news talent. We want to build these new newscasts using that experience and journalism we’re known for. We’re making some new additions, as well as making a few changes that take advantage of that overall experience. When you’re home sick from school/work you don’t want to watch four hours of the Today Show, two news broadcasts where they probably still tell you stale sports scores and traffic news despite everyone already being at work and a Show Me St. Louis! You want to watch deliciously awesome crap! You need a flat Sprite for your head! It’s not something you’d normally drink, but it’s freaking great right now. Sure there are people that are home at that time everyday that aren’t sick, but those people should just go clean something, change someone or sandwich-ify whatever’s in the fridge for me.